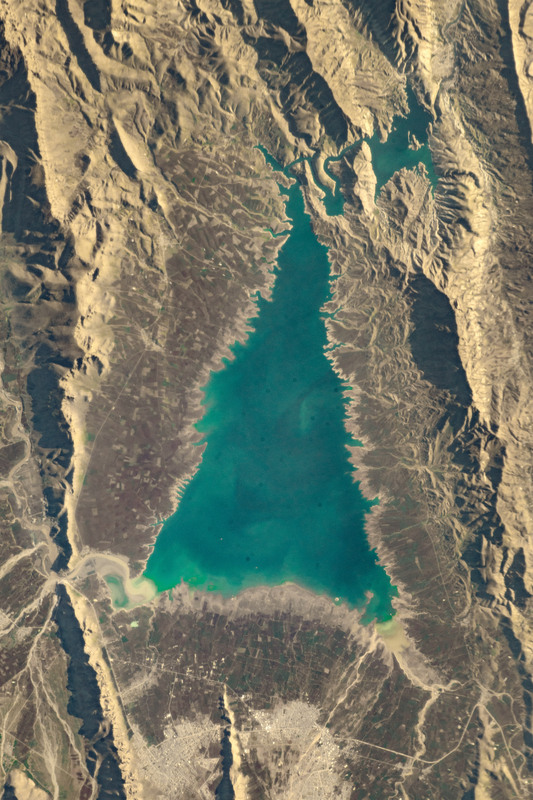 Looking down from space, features on Earth appear in many familiar shapes—and Lake Dukan just happens to look like a Christmas tree. The image above was taken on December 3, 2018, by astronaut Alex Gerst. Lake Dukan is separated into two parts by a winding gorge. The larger portion looks like the body of an evergreen conifer, while the smaller lake is reminiscent of a tree topper. The “ornaments” on the tree (the dark circles) are artifacts from the astronaut’s camera lens. Lake Dukan is the largest lake—covering around 25,000 hectares (97 square miles)—in Iraqi Kurdistan, an autonomous region of northern Iraq. Arguably one of the most beautiful sites in the region, Dukan is a popular picnic destination where many tourists swim, boat, and fish in the lake. The image below shows a wider view of the lake, acquired by the Operational Land Imager on Landsat 8 on November 20, 2018. 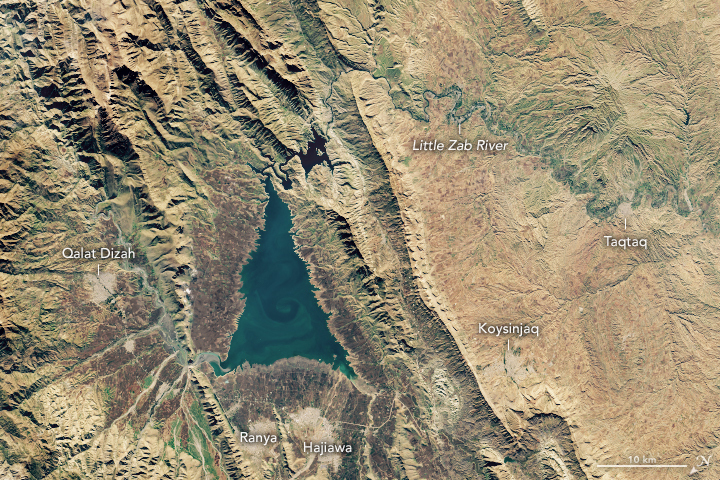 Situated in the Zagros Mountains, the bright blue lake stands out against the surrounding yellow and green mounds. The swirls in the lake might be a phytoplankton bloom or suspended sediment. Lake Dukan is actually manmade; it is a reservoir created by the construction of the Dukan Dam. One of the oldest dams in Iraq, the Dukan Dam was built in 1959 on the Little Zab River to control flooding, aid irrigation, and provide hydroelectric power to the town of Dukan. While the lake is fed by Little Zab, it also receives water from the Hizop stream. Both rivers are fed by rainfall and snowmelt, leading to peak discharge in the spring and low water levels in the summer and early fall. The lake supports a variety of life. The surrounding land is mostly used for agriculture and grazing, as more than 70 villages and towns are situated around the basin. Surveys of the region reported more than 180 species of birds. Two near-threatened species—the Eurasian otter and striped hyaena—have also been spotted in the region by local fishermen. General Board of Tourism of Kurdistan Dukan Lake Resort. Accessed December 20, 2018. 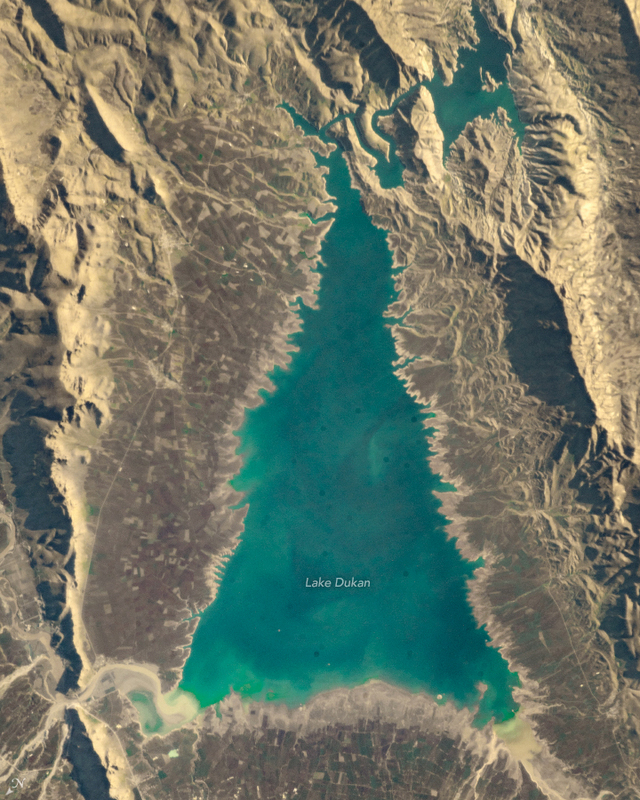 Nature Iraq Dukan Lake Accessed December 20, 2018. NASA Earth Observatory image by Lauren Dauphin, using Landsat data from the U.S. Geological Survey. ISS Photograph by Alex Gerst, European Space Agency/NASA. Story by Kasha Patel.